Self-knowledge is the most difficult thing – not because it is difficult, but because you are scared to know about yourself. A deep fear exists. Everybody is trying to escape, escape from himself. This fear has to be understood. And if this fear exists, whatsoever you do will not be of much help. You may think that you want to know yourself, but if this unconscious fear is there you will continuously avoid, you will continuously try to hide, deceive. On the one hand you will try to know yourself, and on the other hand you will create all sorts of hindrances so that you cannot know. Consciously you may think, “I would like to know myself,” but in the unconscious, which is bigger, stronger, more powerful than the conscious, you will avoid self-knowledge. So the fear has to be understood. Why are you afraid? One thing: if you really penetrate within yourself, your image that you have created in the world will prove to be false. Your whole past will come to mean nothing, because it has been like a dream. You have invested so much in it, you have lived for it, and now to know that it has been a false phenomenon you feel hurt: then your whole life has been wasted. If whatsoever you have been living has been a pseudo-life, not authentic, if you have never loved but just pretended to love, how can you encounter yourself? … Because then you will come to know that the whole thing has been a pretence: not only have you pretended that you love, you have also pretended that you are happy when you love. You have deceived nobody else but yourself. And now to look back, to look within, fear grips you. You have been thinking that you are something unique; everybody does. That is the most ordinary thing in the world, to think oneself extraordinary, something special, ‘the chosen’. But if you look at yourself you will come to know that there is nothing, there is nothing to be egoistic about. Then where will the ego stand? It will tumble down, fall down to the dust. Fear is there, so you do not look at yourself. In not looking, you can go on creating dreams about yourself, images about yourself. And it is very easy and cheap to create an image, but it is very difficult and hard to really be something. One always chooses the cheapest – and you have chosen the cheapest. Now, to look at it is difficult. If the rate is cheaper, you can even buy nothing. And that’s what you have done. To create an image that you are unique is cheap, but to be unique is arduous, very hard. Many, many lives of struggle, striving, many lives of effort culminate into something when you become unique. But to believe that you are unique is just cheap, you can do it right now, there is no need to even move. And you have been believing in cheap things – that’s why fear exists. You cannot look at yourself. All that you have been thinking yourself to be you will not find there – and you know it well. Who else will know it as well as you know? If you think you are beautiful, then you cannot look in the mirror if this beauty is just an idea. And you know well! Rather than looking in the mirror, you will break all mirrors. Whenever an ugly man or an ugly woman looks into the mirror, he or she thinks that something is wrong with the mirror – because it is so painful to realize that you are nobody. It is always the other who is wrong, who is crazy. That’s how you protect your own so-called sanity – this is a protection. And a person who cannot look at himself, basically cannot look, because he is not only afraid of looking at himself – basically he is afraid of looking…. Because when you look at the other, the other can become the mirror; when you look into the other, the other can indicate something about you. In the other’s eyes you are reflected, so you cannot look at the other. You create a fiction about yourself and then you create a fiction about others; then you live in a dream world – that is how everybody is living. And then you ask how to be blissful. Your nightmare is natural: whatsoever you have done, only a nightmare can come to flower from it. And you ask how to be at ease. No one can be at ease with fiction, only with fact. Howsoever hard it may be to accept, only fact can make you non-tense, only fact can lead you towards truth. If you deny the factuality then there is no truth for you, and then you go on moving around and around and never hit the center. And I tell you, you are still struggling with the bag! And not only that – that you are not able to open it – but you don’t even want to open it. All these corkscrews and screwdrivers and chisels and hammers that you carry with you are just phony. You don’t even want to open the bag, because once you open the bag then what are you going to do? Then the patient – which is you – then the patient has to be diagnosed, then you have to look into yourself. So everybody is occupied with the bag – that’s what your business is, your profession, your occupation. You may be a poet or a painter or a musician, but all your occupations are just ways to remain engaged outside. That’s why nobody is ready to be alone, even for a single moment. It is so fearful, because when you are alone you may come across yourself. When you are alone what will you do? When you are alone you are with you – and the reality may erupt. So everybody tries for continuous occupation, to be occupied twenty-four hours a day. When you are occupied you look a little happy, when you are not occupied you become unhappy. Psychologists say that if a man is left unoccupied for a long period he will go insane. But why? Why, if you are sane, should you go insane if you are left unoccupied for a long period? If you are sane, then in a long fallow period, a long period where nothing is done, you will become more sane, you will grow. But why should you become insane if you are left alone for a long period? – because you are insane! Your occupation simply hides the fact. Look around – because it is difficult to look at yourself – but look around, look at people. A man is constantly occupied with money. What is he really doing? Focusing his mind on money so he can avoid himself. He goes on thinking about money, morning, evening and night. Even on his bed he thinks about money and the bank balance. What is he doing with the money? That’s why when he gets the money he is at a loss – what to do now? So the moment he gets the money he was thinking about, he starts thinking about more money – because money is not the thing he was asking for. Otherwise, when he gets it he should feel fulfilled, but not even a Rockefeller or a Ford is fulfilled. When you get money you immediately demand more, because the basic motivation is not the money, the basic motivation is how to remain occupied. Whenever occupation is not there you are uncomfortable, a deep unease arises in you. What to do? If there is nothing to do, you will read the same newspaper again and again and again – the same newspaper you have already read completely. If there is no occupation, you may do anything which is not needed at all, but you cannot remain at ease. Hence the insistence of all the masters, that if you can sit for a few hours without doing anything, soon you will become enlightened. An unoccupied state of mind is meditation. An occupied state of mind is the world, the sansar. It doesn’t matter what type of occupation – whether you are interested in money or politics, or social service or revolution, it makes no difference: your sanity is the same. Even if you leave Lenin alone he will go mad: he needs the society and the revolution; if there is nothing to do it will be impossible for him to exist, his sanity will be lost. He is sane through you. Because of so much work, the energy is lost in the work, you are exhausted, you can go to sleep. Old men look almost crazy and eccentric, and the reason is that they have nothing to do. Old age is not the reason: they are now unoccupied, they are not needed, retired. Retired people always become a little eccentric. Something has gone wrong with them. The man was okay – he may have been a president or a prime minister of a country, but retire him and see what happens. Immediately he deteriorates. His body and mind both deteriorate and he starts becoming a little eccentric, crazy, mad, because now there is no occupation, nobody looks at him, nobody is interested in him. He has no work to do, nowhere to focus his mind. The whole turmoil goes in and in – he becomes a turmoil. Psychologists say that retired persons die ten years earlier than they would have died if they had still been occupied. What happens? Why is it so difficult to be with yourself? And you always think that others should feel happy with you – your wife should feel happy with you, your husband should feel happy with you. You yourself never feel happy with yourself, so how can anybody else feel happy with you? If you are such a boring personality that you yourself get bored with yourself, how is it possible that others can tolerate you? They tolerate you for other reasons – not because you are such a loving person, no! They tolerate you because you give them an occupation. A husband is enough occupation for a wife, a wife is enough occupation for her husband. This is a mutual deception: they have agreed to deceive each other and help each other to remain occupied. You cannot look at yourself, you cannot come to self-realization, because that is a very faraway goal. You cannot turn and see the ‘facticity’ about yourself, and the reason is: a false image, a false identity, a false idea that you are somebody very important, significant – the whole world will stop if you die. What will happen to the world when you are not there? When you were not there, what was happening? The world was a little more at peace, that’s all. When you are not there, there will be a little less trouble in the world, that’s all – because one uneasy person will have disappeared, and he was creating uneasiness in others. But to support the ego all these fictions are needed. Napoleon looked at him and said, “This is an emperor’s coat – it may be dirty but I cannot change it for an ordinary coat!” He walked as if he were still the emperor, he talked as if he were still the emperor, he ordered – there was no one to listen to his orders, but he continued ordering. He would write letters and orders, and he had brought his letter-pad with him. In his mind he was still the emperor. What was happening to this poor man? And unoccupied, he began to be permanently ill. The doctor who was with him kept a diary, and in the diary he writes, “I feel that he is not really ill, now illness is just an occupation. Sometimes he says ‘my stomach,’ sometimes ‘my head,’ sometimes ‘my legs,'” and the doctor thought that nothing was wrong, the body was absolutely okay. But now he had nothing to remain engaged with, now the only ‘other’ was the body. The whole world of others had disappeared, he was alone. Now the body was the other, so he remained occupied with the body. Many people are ill as an occupation: in the world, fifty percent of illness exists as an occupation. You remain occupied, then you need not face yourself. Otherwise, what would have happened to Napoleon? If he had faced himself, then he would have seen that he was a beggar – and that would have been too much. He died an emperor. Before his death he ordered how he should be given the last send-off, every detail. Nobody was there to follow those details because nobody was interested. But he gave the orders, and he must have died at ease thinking that he was going to be given the last send-off like an emperor. With Napoleon the thing is so clear because he had been an emperor. That too was a fiction – supported by the society. But nothing had changed, Napoleon was the same, only the support had disappeared. This is difficult to understand: there are fictions when the society supports you, there are fictions when nobody supports you. That is the difference between a sane and an insane person: a sane person is one whose fiction is supported by the society; he has manipulated the society to support his fiction. An insane man is one whose fiction is supported by nobody; he is alone so you have to put him in the madhouse. But your support doesn’t make anything real – if it is a fiction, it is a fiction. If you look at yourself, immediately you will feel you are nobody, nothing important. But then the whole earth, the base under your feet is withdrawn, you are in an abyss. Better not to look at it – just continue in your dreams. They may be dreams, but they help you to live in a sane way. Not only can’t you look at yourself, you cannot look at the other either, because the other is also representative. So you also create fictions about the other: through hate you create a fiction that the other is a devil; through love you create a fiction that the other is an angel, or a god. You also create fictions about the other; you cannot look directly, you cannot see through them, your perception is not immediate. You live in a maya, in an illusion created by yourself. So whatsoever you see it is exaggerated: if you hate a person, he immediately becomes the devil; if you love a person, he immediately becomes a god. You exaggerate: if you see bad, then you exaggerate and transform it into the ultimate badness; if you see good it becomes the ultimate good, a god. But it is difficult to maintain these fictions, so you have to change again and again. Why are you so exaggerated in your perceptions? Why don’t you see clearly what is there? – because you are afraid to see clearly. You want clouds around so everything remains in a mist; you want not to know yourself. And all those who have known, they insist: “Know thyself!” Buddha, Jesus, Socrates, they go on insisting, “Know thyself!” The whole insistence of religion is to know thyself. And you insist not to know yourself. Sometimes you even play the game of knowing yourself. I come across many people who are playing the game of knowing themselves, and they don’t want to know. This is a game: now they again want to create a new fiction, a religious fiction, and they come to me so that I can support them. They say, “I have realized this, I have realized that,” and they look at me and their eyes are begging. If I say, “Yes, you have experienced this,” they are supported, they go away happy. And if I say, “No,” they become unhappy, they never come back to me again. They simply disappear because they have to find somebody else, some other authority. But why are you in search of an authority? Why do you need a witness? If you have realized something, you have realized it – no need for any authority, because the experience in itself is self-evident. If you realize your soul, you will not need anybody’s recognition, a certificate. Even if the whole world says you have not realized, it makes no difference; a vote is not needed, you know it has happened. If a blind man has started seeing, he doesn’t require anybody as a witness to say that now he can see – he can see, that’s enough. But if the blind man is dreaming that he can see, then he will need some authority to seal the fact that this is true, that he can see. People play games; even spiritual games exist. And unless you stop playing and become sober about the fact that fictions have to be dropped and the hard truth has to be faced as it is, nothing is possible – because this is the door. And if nobody supports you, then you yourself support yourself. Then you stop talking with people, because they cannot understand you. Then he became a little doubtful, puzzled, and he said, “But who knows, it may be just my mind playing tricks.” That he knew well. Whenever you are playing tricks, deep down you know it, and nobody is needed to show it to you – but you want to hide the fact. If I accept your fiction, then you can help my fiction; this is the mutual game that is going on. And this game is so satisfying that you don’t want to break it. But a deep discontent also follows like a shadow. It is bound to be so because the whole thing is a fiction. A beggar, thinking that he is an emperor, knows that he is a beggar. This is the problem: he thinks he is an emperor, pretends he is an emperor, and knows deep down that he is a beggar. He feels very satisfied about the emperorhood, but a deep discontent follows like a shadow: “I am just a beggar.” This is your problem: you think something about yourself, and you know it is not true. You have never loved, you have pretended; you have never been honest, you have pretended; you have never been true, you have pretended – your whole life is a long series of pretences. And now, because you have wasted so much life in it, just to recognize that the whole thing has been only a fiction is too much. Now you think, “Somehow I’ll carry it to the very end.” But if you don’t finish it, even if you carry it up to the very end it is not going to give you anything. It is simply a wastage; it is a simple wastage, and in the end the whole frustration will erupt. That’s why death is so difficult. Death has nothing dangerous in it, it is one of the most beautiful phenomena in the world – you simply go to sleep! And everything goes to sleep: a seed sprouts and then there is a tree; then again, seeds come and they fall down and go to sleep; then again they will arise. After every activity a rest is needed. Life is an activity, death is a rest. It has to be there so new life may arise out of it. Nothing is wrong in death, nothing is dangerous in death. But why is everybody so afraid of dying? – because at the moment of death all your fictions will disappear; at the moment of death you will see that your whole life has been a wastage. Why do people say that at the moment of death a person comes to see his whole life? It happens, it is true: at the moment of death a person has to face his whole life, because now there is no future and he cannot create any more fictions. For fictions the future is needed, because fictions exist in hope, fictions are for tomorrow. Death brings home the fact that now there is no tomorrow; tomorrows are finished, now there is no future. Where can you dream? Where can you project your fictions now? Nowhere to go! Suddenly you are stuck. And your whole life you have been creating fictions in the future. Now you are stuck, there is no future – where will you look? You have to look at the past, and at the moment of death the society is disappearing; you have to look at yourself, there is nothing left. Then you come to realize the pain, the anguish of a whole life wasted. If it can happen to you before death, you become a religious man. A religious man is one who has realized before death that which everybody realizes in death. A religious man is one who has looked while still alive – looked into the past, seen through the whole game, realized the fictitiousness of his life – looked into himself. If you look into yourself the change is certain, absolutely certain, because once the fiction is realized as a fiction it starts dropping. To be retained, a fiction has to be retained as a fact; if it is to be carried, even an untruth has to be thought of as true. The moment you realize that this is untrue and the thing penetrates, it starts dropping – it is already out of your hands, you cannot catch it. To continue the dream one has to believe that this is not a dream, this is reality. The moment you become aware that this is a dream, the dream is already disappearing. But not to know is your whole effort; you avoid it – that’s why you are never at ease when you are alone. Even if you go to the Himalayas you take your radio with you, and the radio carries the whole world; even if you go to the Himalayas, your wife, your friends, your children are with you. You go for a holiday but you never go – you carry the whole atmosphere there to the beach, to the hills, and again you are surrounded by the whole nonsense. It happened once, a shipwrecked sailor reached a deserted island. For five years he had to live there because no ship passed. He built a small hut, he lived there, but he continuously thought of the world. Everything was so peaceful, as it had never been. He had never known, not even imagined that such peace was possible. The island was completely deserted, there was nobody – that was the only problem, otherwise everything was perfect. The streams were beautiful, the trees were filled with fruit; he could eat, he could rest; there was no worry, nobody to worry about, nobody to create trouble. And he had always thought that someday he would like to go to a peaceful place – and suddenly he was there! But it was unbearable. Silence is unbearable, one has to be capable of bearing it – it can kill you. It was so difficult for this man, but he was an architect so he started building small things, just small models, just to remain occupied. He made a small street and he named the street; he made not only one church, he made two churches – one near his house, another at the other end of the town; he made small shops where one could go shopping. He created a whole town. You need two churches, at least two religions, because the mind is a duality: “This is the church I say yes to, and that is the church I say no to. That is the wrong church; wrong people go there, those who don’t belong to me.” He was alone, but he had created the whole world. And he was eager to go back to the world, he was not ready to look at the newspapers. And he did well, because once you look at the newspapers you would not like to be rescued. Look at your newspapers! What is happening in the world? Is it worth living in it? But you read, you don’t look; your reading is not looking, you just read sleepily. You don’t realize what is happening in the world, what man has done to man, what man is continuously doing to man: such violence, such foolishness, such a poisoning of every type of significance, of everything that is beautiful and true and good – everything poisoned. Would you like to live in it? If you look, then it will be very difficult to decide to live in it. That’s why it’s better not to look, just move as if you are in a hypnosis. In order not to look at oneself, another technique has been used that Jesus talks about in this sutra, and that technique is: look in the other for all that is wrong so you can infer that you are good. There are two ways to be good: being good – that is difficult; then there is another way to be good and that is relatively: prove that the other is wrong. You need not be good, just prove that the other is wrong. That gives you a feeling that you are good. Hence we all go on proving that the other is the thief, the other is the murderer, the other is the evil one. And then, when you have proved that everyone is wrong, suddenly you have a feeling that you are good. This is a relative phenomenon: no need to change yourself, just prove that the other is wrong. And this is very easy – nothing is as easy as this. You can magnify the badness in the other; you can magnify and nobody can prevent you from doing it. And before that magnified, projected badness, evil, you look simply innocent. That’s why if somebody says about someone, “He is a bad man,” you never argue against it, never; you simply accept it. Rather, on the contrary, you say, “I always knew that that was the case.” But if somebody says something good about someone you argue, you require proofs. Have you observed the fact that there have been millions of people who have said, “We will believe in God but first give us proofs”? But nobody has yet written a book requiring proofs for the devil – nobody! Nobody requires any proof for the devil, nobody says, “I will believe in the devil only when he is proved.” No, you already know the devil is there all around. Only God is missing, he is not there. JESUS SAID: THE MOTE THAT IS IN THY BROTHER’S EYE THOU SEEST, BUT THE BEAM THAT IS IN THINE EYE THOU SEEST NOT. WHEN THOU CASTEST THE BEAM OUT OF THINE EYE, THEN THOU WILT SEE CLEARLY TO CAST THE MOTE OUT OF THY BROTHER’S EYE. You go on looking on the other as darkness. This may give you an illusory feeling that you are light, but this cannot give you light. And if you try to make the other enlightened because you think he is in darkness, that is going to make things worse – that is adding insult to injury. In the first place darkness is projected by you, and in the second place you are not light yourself so you cannot enlighten the other. So people who try to transform the society are the mischief-makers; people who try to change the other are always dangerous. They are murderers in a very subtle way, but their murder is so subtle that you cannot catch it. They don’t kill you directly, but they cripple you, they cut you – and ‘for your own good’, so you cannot say anything against them. Your so-called saints are just trying to destroy the darkness which is not in you or may not be in you, but which they see to be there. They see a hell in you because that is the only way they can see and feel themselves as heavenly. Doctors can kill you before your time; do-gooders can kill you before you are due, and do-gooders are always dangerous. But you are all do-gooders in your own ways, small or big. Everybody wants to change the other because everybody thinks the other is wrong; everybody wants to change the world. And this is the difference between a political mind and religious mind. The politician starts from the world, but he never reaches any goal because the world is so big – and the world is not the problem. He creates more problems: through his medicine, many more diseases arise which were not there; through his efforts he creates more misery. A religious man changes himself. 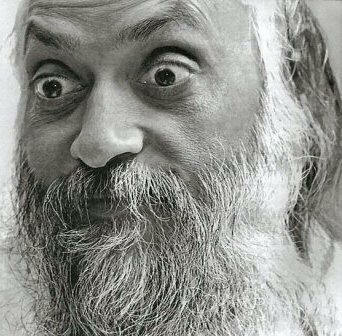 He only changes himself because that is the only thing that is possible. You can only change yourself, and the moment you are changed the world starts changing, because you are a vital part in it. And when you are enlightened – changed, totally changed – you become more vital; you now have the supreme energy in you. A Buddha simply sits under his bodhi tree and the world is transformed. And the world will never again be the same as it was before Buddha. A Jesus is crucified, but that becomes a mark: history is divided from that day, history will never again be the same as it was. So it is good that we acknowledge and divide the years in the name of Jesus: we say ‘before Christ’, ‘after Christ’. It is good, because before Christ a totally different humanity existed; after Christ a different humanity came into being. The phenomenon is so vital that whenever there is a Christ, whenever a consciousness rises as high as the consciousness of Jesus, all other consciousnesses are simultaneously affected. They also rise, they also have a glimpse – and they cannot be the same again, the same old level cannot be achieved. A religious man simply transforms himself, but the transformation is possible only if you look; the transformation is possible only if you drop the fictions. If you come to realize your ‘nobodiness’, if you come to realize your nothingness, if you come to realize your inauthentic life, immediately it starts dropping. Knowledge is revolution – not knowledge that you gather through the mind, but knowledge that you come to possess when you encounter yourself. Self-knowledge is a transforming force, nothing else is to be done. This has to be understood: people think, “First we will know, and then we will change.” No! The moment you know, change occurs. Knowledge itself is transforming; it is not that first you know and then you do something to change. Knowledge is not a method, it is not a means; knowledge is the end in itself. But when I use the word knowledge I mean self-knowledge. All other knowledge is a means: first you have to know the know-how and then you have to do something. But with self-knowledge the quality is absolutely different: you know, and the very knowing changes you. Drop the fictions. Gather courage to know yourself. Drop the fear and don’t try to escape from yourself! And Jesus says: WHEN THOU CASTEST THE BEAM OUT OF THINE EYE, THEN THOU WILT SEE CLEARLY… only when the fictions are dropped. They are the beam in your eye, they have become a mist, a smoke, a cloud in your eye. You cannot see clearly, you cannot see anything clearly, everything is blurred. When the beam is cast out from thine eye, you will see clearly. Clarity must be the goal – just clarity of the eyes so that you can look directly and penetrate to the fact without creating any projection around it. But this is very difficult because you have become so automatic in it, so mechanized. You look at a flower and immediately your mind starts talking: “A beautiful flower, never seen before.” Some poetry, borrowed of course, arises. The flower is missed, the clarity is not there. Words blur – can’t you see a flower without naming it? Is naming a must? Is your naming the flower going to help in any way? Will the flower be more beautiful if you have the botanical knowledge about it? That is the difference between a botanist and a poet: a botanist knows about the flower, the poet knows the flower. The botanist is simply ignorant – he knows much but it is about and about – the poet sees. In Sanskrit there is only one word for rishi and kavi, for the seer and the poet. There are not two words, because they say whenever there is a real poet he is a seer; whenever there is a seer he is a poet. Clarity – then life becomes poetry. But then you have to look at the flower without naming it – is it a rose or something else? Why are words needed? Why do you say, “It is beautiful”? Can’t you see the beauty without speaking? Is it necessary to repeat that it is beautiful? What do you mean by repeating it? It means the flower is not enough; you need a suggestion that it is beautiful, then you can create beauty around it. You don’t see the flower, the flower is just a screen, you have to project beauty on it. Look at the flower and don’t say anything. It will be difficult, the mind will feel uneasy because it has become habitual. It constantly goes on chattering. Look at the flower and make it a meditation. Look at the tree and don’t name it, don’t say anything. There is no need; the tree is there – why say anything? They went out, and the morning was so beautiful, so silent, the birds were singing, and just out of habit the guest said, “How beautiful!” Just this much, nothing much; for a one hour walk, this is not very much: “How beautiful!” But Lao Tzu looked at him as if he had committed a sin. “How beautiful!” It fell like a stone in a silent pool. “How beautiful!” fell like a stone in a silent pool and the whole thing became rippled. Meditate near a tree, meditate with the stars, with the river, with the ocean, meditate in the market with people passing. Don’t say anything, don’t judge, don’t use words – just look. If you can clear your perception, if you can attain a clarity of looking, everything is achieved. And once this clarity is achieved you will be able to see yourself. Self-knowledge happens to a clear mind, not to a mind filled with knowledge, not to a mind filled with judgments of good and bad; not to a mind filled with beauty, ugliness, but to a mind that is without words. Self-knowledge happens to a wordless mind. It is always there, you only need a clarity of mind to perceive it so that it can be reflected; you need a mirrorlike mind so that the reflection becomes possible. Once this happens, then you can help your neighbor, never before. So don’t advise anybody! All your advice is dangerous because you don’t know what you are doing. Don’t try to change anybody, not even your son, not even your brother. Nobody is in need of your change because you are dangerous. You can cripple, you can kill, you can maim, but you cannot help transformation. Unless you are transformed don’t move into another’s life. When you are filled with light you can help. Really, then there is no need to make any effort to help. Help flows from you just as light flows from a lamp, or fragrance comes out of a flower, or the moon shines in the night – no effort on the part of the moon, it just flows naturally. When there is no effort, then it is a blooming. Then it is just like a flower blooming, there is no effort to bloom. 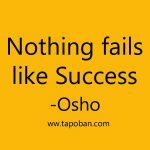 A Basho speaks, a Buddha speaks – no effort, it just happens! It is a natural phenomenon when Buddha is speaking. When you are speaking it is not a natural phenomenon, other things are involved: you want to impress the other, you want to change the other; you want to control, manipulate the other, you want to dominate the other; you want to give the impression that you are a man of knowledge – you want to feed your ego. Many other things are involved. You are not blooming. It is a great political game when you talk, there is a strategy in it, tactics. But when a Basho talks, he blooms. If somebody is there, then he will be benefited – but to benefit the other is not the goal, the benefit can happen effortlessly. The flower does not bloom for you. If you pass by the path the fragrance will reach you; you can enjoy it, you can feel ecstatic, you can be grateful – but the flower never flowered for you, the flower simply flowered. A Buddha blooms, a Jesus blooms, and the whole world is benefited. But you go on trying to benefit others and nobody is benefited, rather you do harm. The world would be better if there were less mischievous people around changing and transforming it. All the revolutions have simply done harm, and every reform has led into a deeper mess. D.H.Lawrence once suggested that for a hundred years we should stop all revolutions, we should stop all universities, we should stop all reforms and all talk about them, and for a hundred years we should live like primitives. The suggestion is beautiful. Then humanity could come to be alive again, the energy could arise and people could attain to clarity. Words have dimmed, they have become too burdensome, and you carry so much knowledge that you cannot fly in the sky. You are burdened so much that you are not weightless, your wings are not free. And you cling to the things that have become your prisons and bondages because you think they are very valuable. They are valueless things, and not only valueless but also dangerous to you: words, scriptures, knowledge, theories, ‘isms’- they all cripple you. Clarity cannot be attained through them. Put aside all scriptures, put aside all judgment. THE MOTE THAT IS IN THY BROTHER’S EYE THOU SEEST, BUT THE BEAM THAT IS IN THINE EYE THOU SEEST NOT. Only that can be helpful. If you become a light unto yourself you become a light unto others. But that is a blooming, and everybody is benefited – knowingly, unknowingly, everybody is benefited. You become a blessing. I get from this and your recent articles to get to know yourself. From my Witness position observe without judgment and see myself for who I really am–the good, the bad, and the ugly. Stick with the observation, don’t make excuses for the bad and ugly. Let my observations of myself be my sole occupation instead of occupying yourself with other people’s affairs. Let change occur in me–don’t force it just keep shining a light on my thoughts and actions. The change in me will inspire a change in others. Yes K, you understand it perfectly. Let’s see if there is a way from understanding to the beingness of it. But you see how similar the “to do” of it to the Bug free mind? Yes, I do see the similarity. It is one thing to know or understand, but I must continue to apply what I think I know so that it becomes my nature or the beingness of it. Understanding is the easy part, now it’s up to me to do the work. K, you need to listen to yourself as you speak, and then you’ll hear that you are entirely speaking from the mind. No access to beingness from the mind. You need to listen (read) without mind.